The Minister told international media in Davos, Switzerland last week that he met South Africa President Cyril Ramaphosa, his Finance Minister Lesetja Kganyango and that country's Reserve Bank governor Tito Mboweni as part of negotiations for the package. Prof Ncube rubbished reports that the neighbouring country had declined assisting Harare. "We are at the beginning of the conversations, we will see how things evolve to see if South Africa can be a partner in our arrears clearance. We know that we have excellent relations that go back decades, we have a bi-national commission. We have a relationship between the central banks and ministries of finance. You have seen comments from President Cyril Ramaphosa which have been very positive and we want to thank him for that. "I just met President Ramaphosa briefly and I also had coffee with minister Lesetja Kganyago. Yesterday (last week) I met Mboweni. We thank President Ramaphosa for the support. South Africa has full confidence with the Zimbabwe Government. It's not about South Africa extending financial resources but we also need its support in Bretton Woods institutions (International Monetary Fund and the World Bank), Paris Club. We need that extra voice from the region to successfully restructure our debt globally." Zimbabwe's international debt to financial institutions such as the IMF, the World Bank, the African Development Bank (AfDB) and the Paris Club is about US$7,4 billion. Prof Ncube said Zimbabwe and South Africa enjoyed cordial relations through trade. "We always cooperate with South Africa through trade. That's not new; we want to see if that can be increased. This (financial package deal) is a normal discussion and it's ongoing. We don't know where it will end up in terms of resources that we have requested," he said. Prof Ncube said Government was implementing a cocktail of measures to transform the economy into an upper middle class income by 2030 in line with President Mnangagwa's vision. "We are already implementing fiscal discipline in terms of reducing civil service, we all took a five percent pay cut from the President, Vice Presidents, Ministers, Deputy Ministers and heads of parastatals to show that we are serious about meeting the people of Zimbabwe half way. "We are delaying the purchase of vehicles for Ministers and Members of Parliament, so we are very serious about cuts in the public sector." Prof Ncube also explained that the fuel situation had normalised following President Mnangagwa's interventions to contain the artificial shortages. He defended the fuel of $3.31 per litre saying, "Our fuel was being bought for something like 40 cents (USD) per litre and was being sold internally and also externally to other countries. Truckers were coming in to fill up and offload in Zambia. Imagine buying fuel for about 40 cents (USD) and then resell it in Zambia for over a US$1. So we closed that gap." The Minister also hosted a Zimbabwe Investor Forum in Davos with over 80 Swiss and European companies. "We discussed economic outlook, development plans and shared investment opportunities in Zimbabwe. 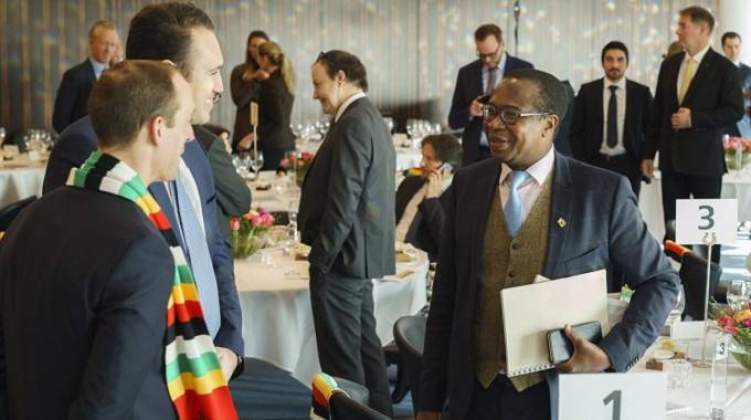 Zim business delegation engaged and forged new economic ties with European businesses….The global investors are pretty savvy. They understand and are very excited about the mining and agricultural opportunities in Zimbabwe," Mini Ncube posted on social media last week.